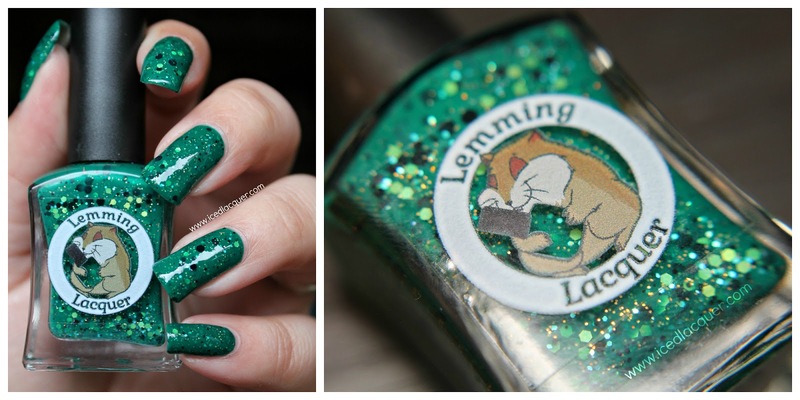 Lemming Lacquer "Ravens & Writing Desks"
Hi readers! I'm just popping in with a quick little review of a both new and new-to-me brand called Lemming Lacquer. They just released their first collection last month full of beautiful Alice in Wonderland themed polishes. When I saw this green shade called "Ravens & Writing Desks" I knew it had to be my first purchase from the brand! "Ravens & Writing Desks" - A green crelly base with a hint of teal filled with metallic gold, green, black, white, and turquoise hexes. If you can even believe it my photos show just one thick coat plus top coat. I did do a tiny bit of dabbing to fill in some thinner spots, but I honestly only needed one coat. I don't even understand how it's possible for a polish to be so pigmented! My opinion: I am SO ridiculously impressed with both this brand and polish! Everything from the color, formula, labels, and even packaging is so fantastic. My order came with a personalized note card and was wrapped in cute tissue paper with Alice in Wonderland themed stickers! The labels are ridiculously cute, and I really like the bottle shape. Very unique! The color looks fantastic on you!